What an Experience, " Being an Early Head Start Parent"
I can clearly remember my hesitation, the worry, and the anxiety I was experiencing when I first found out my child was going to be a KCEOC student. Why all this worry?, you might ask. Well, I'll tell you. I had stereotyped this state program. I thought the workers would be underpaid and undereducated, and the program would be limited on funds. As a result, I thought "my child will pay the price." What was I sending my child into? I knew I was financially between a rock and a hard place. So with all of this in mind, I enrolled Kinady in the program. The first meeting was set up between the staff and myself, and I had prepared every question I could think of. I was determined to find a reason to back out, a legitimate excuse for why I was not going to send her there. Missy Scent, my daughter Kinady's present teacher, was my first encounter. Missy was patient with me. She answered every question this picky mother threw at her, and to my surprise I liked every answer. Yes, they do serve a balanced meal without sweets and junk food. No they don't sit them in front of the TV all day. Yes, there is a curriculum for learning. Yes, I can check in on them at any time. There is a plan for biters, and they do use thinking time, and the list went on and on. I was then invited to see the classroom. I thought, "uh huh, here's the true test." Boy was I surprised. I found clean, bright, open play area, lots of fun learning toys, each child with it's own cubby and cots and toothbrushes, tiny little chairs and pottys. Everything labeled and everything neat. We even had shoe covers to keep the room sanitary. Then I met the rest of the staff. I thought "wow this seems too good to be true - what gives?" Now two years later, I have found out that nothing gives. I have been blessed not only with childcare, but many more things than I can't describe. I can't say Thank You enough to her teachers - Ms. Missy, Ms. Deb and Ms. Tanya. I love them and I mean that. They have become a part of my life and Kinady's forever. These are good Christian gals who are fun-loving, caring, patient, giving and so much more. I have walked into that school on many a day when I would have thrown my hands up in despair at what they endure every day. All those little angels acting like little devils - mine included. There are her teachers smiling with their hair standing on ends, and Ms. Deb saying "Now friends you better stop that, put on your walking feet," and as you turn to leave she says,"I LOVE YA TILL TOMMOROW." I know what they put up with. This is a room made up of mostly terrible two's, there's potty training, squealing and climbing the walls, yet in all that my child has learned mountain's of knowledge and ocean's of independence. For that there is not a word to describe my gratitude. As far as the KCEOC program goes, it has done as much for me as it has for my daughter. I like being a part of her school and the activities. I have gone to many meetings and made several decisions concerning outcomes surrounding her school. I have attended several outings including her school trips. 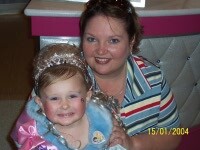 These were special times for my daughter and me, and yes I am a social bug. I have been fortunate enough to be invited to several events with this fun loving bunch. This not only made me feel a part of the school but also gave me a closer rapport with all the staff. For the past two years, I have attended KHSA in Louisville. What an experience. This is not your ordinary conference. Each year has been themed and all the activities surround that theme. We attend our choice of some informative classes and take home that knowledge to help us. We have a great time. It is all a part of the experience with KCEOC that I enjoy. I know that if there was a need in my family for something, this agency would do everything in their power to see to it; and that's on a professional or a personal level. I love being a part of this group and I hope they enjoy us being a part of them as well. Again, Thank You for everything.